There is now an extensive range of different printers on the sites of suppliers like Ryman, and this range of choice can sometimes make the selection of the best model seem a difficult task. As with so many other tech purchases, the way to zero in on the right printers is to first start by establishing the detail of your regular needs. With printers, this understandably amounts to the type and frequency of the intended usage. Both of these factors have a bearing on spec of suitable printers, which in turn influences both initial outlay and ongoing running costs. Here we look at relative benefits of the most common types of printers. Laser printers were formerly an expensive option, for business rather than home use, but costs for this technology, as with so many things in the IT world, have dropped over the years. Those looking to produce a large volume documents will be happy with the excellent print quality of text produced by laser printers. Ongoing running costs are also low, with the relatively expensive toner cartridges lasting a long time, and commonly averaging a running cost of about 1p per A4 sheet. In contrast, inkjet printers can cost as much as 5p per sheet. However, laser printers designed for the home use market do not usually come with the auto-duplexing function, which allows the automatic printing of both sides of the paper, and so aspiring novelists on a budget should perhaps be aware of this fact. Colour laser printers are a bit more expensive and limited in the quality of colour image that can be produced – they are not really recommended for those looking for a home photograph printer. Inkjet printers are still the most popular for home use. Many inkjet printers can produce excellent quality photo prints and other high definition images, in full colour. Standard or entry level inkjets will perform just this function, and can be picked up inexpensively, although as mentioned can become costly if a large volume of printing is required. For home office use, many choose to spend a little more on an integrated unit. All-in-one inkjet printers can scan, copy and print, and often fax. These kinds of inkjet printers will understandably cost more initially, but will have similar running costs as more basic models. 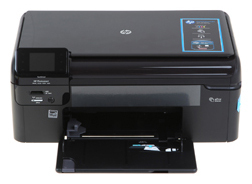 One point to note with the integrated, all-in-one inkjet is the size of the unit, which is usually considerably larger than the standard type, and can eat up limited desk space. While cheaper than laser printer toner cartridges, fresh ink cartridges or refills for inkjets will be required more frequently. This can get expensive, especially if a lot of high definition colour images are printed. Producing draft quality prints when definition is not an issue can go some way to reducing ongoing usage costs, and this is particularly viable when printing text. Laser printers don’t justify their price if you only print a page every two weeks, like a normal user does. Sure it’s nice to print an entire book in two minutes, but how often do you do that? I’ve printed books on my inkjet printer and i didn’t mind the wait, it’s not like i was in that much of a hurry. true that. But then everyone has different usability and needs. Laser printers are very handy for corporations and offices, not so much in a simple household. My mistake, i took it only from a personal experience. But you’re right, if we’re talking about an office then the price is totally justified. Who would have imagined that printers will be needed in homes? Just like the way everybody saw computers as a device meant only for large corporations. However, unlike computers printers are more used in offices and business than homes. This could probably the reason why most of the features of printers for home use stay almost the same through the years. Most companies these days choose All-in-One printers that is wi-fi supported because it just not only make the job much easier and faster but more convenient no need for wiring and configuring how to share a single printer in one network. nice article but I don’t agree with you in a few points (shame on me… ;)). You were writing at the end of your article that inkjet printers are more expensive in operations as a laser printer. That’s not right. I own a multifunction printer (HP Officejet Pro 8600 Plus) and the ink load of the large cartridges is enough to print over 1000 pages. And don’t forget that you don’t have to buy all the colours at once. Some of the inkjet printers has printing costs below the 5p per sheet. Sure it depends on the model. The toner cartridge of my old laser printer was more than $120 for less than 1500 pages. I actually pay for my inkjet far less. I guess it depends on the printer then Holger!